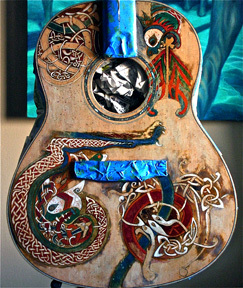 Sinopia is proud to introduce our March 2012 Artist of the Month: Peter Cree. 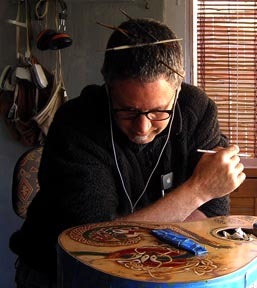 Peter Cree is an artist who works in a variety of media and techniques. He has a background in painting, which he uses in conjunction with his carving talents and music instrument building skills. Currently he focuses on creating three dimensional sculptural objects and building instruments, which he adorns with pigmented shellac. For 30 years I've followed the calling of art, producing a large body of work and have had many exhibitions across the United States and abroad. Art is an uncontrollable force that arises directly from the unconscious.Â My talent is the conduit through which this force flows. I guide it but don't totally control it. My work is mixed media - the combination of carving, painting, sculpture and found objects. Here lie the unexpected results of an Artist's mind. 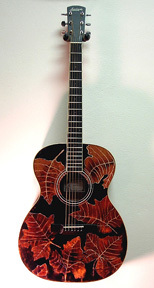 The acoustic world has many traditions and one of the most sacred is the finish. For seventy years most makers have used nitrocellulose lacquer, shellac and now UV polyester and polyurethane. Much is debated concerning the best attributes of each one. The purpose of this work is to use a traditional and proven finish technique in a totally new way. By moving decoration onto the soundboard of a stringed instrument, I defy the notion that you can't decorate the top without compromising the sound. Adding pigment into the lacquer or shellac and applying with a brush, I sand flat and repeat until the image is built up and defined. This technique results in an ultra thin finish that rivals any other in volume and tone, while giving a dynamic visual presentation. Four years ago, after many years of experimentation, I began this project to show that an alternative to the traditional gloss, matte or sunburst finish can be accomplished. Now with this innovation, painting is possible on the soundboard. 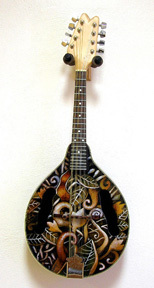 One can incorporate motifs from all cultures and any visual art design onto the surface of fine stringed instruments.